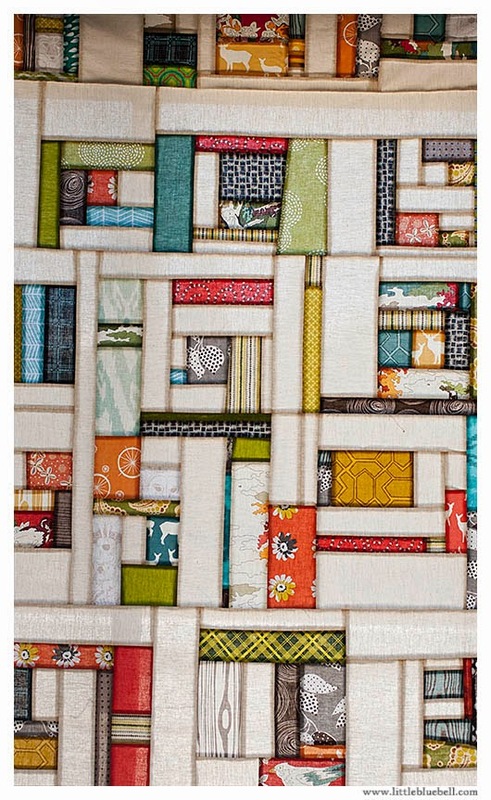 This quilt was inspired by Jacquie Gering's Urban Garden quilt. Jacquie recently traveled to the Bay Area to teach an improv workshop and I was lucky enough to attend. Jacquie is such an inspiration and she has an infectious teaching style. She shared lot of advice throughout the workshop and spent time helping each of us with our projects. At one point, Jacquie came over to me and we were talking about this little scrap block I had been working on. I didn't like it and I couldn't seem to let it go. Jacquie held it up with two hands, looked at me with a twinkle in her eye and asked, "May I?" I nodded my head slowly and without hesitating she ripped that troublemaker apart, right down the fresh seam line. It was shocking! It was also the best thing she could have done for me. Now I had two pieces that I could re-work. It was so freeing and it turned out to be a turning point in my process. Let the pieces come together. What's the worst thing that can happen? If you don't like part of it, change it and keep going. 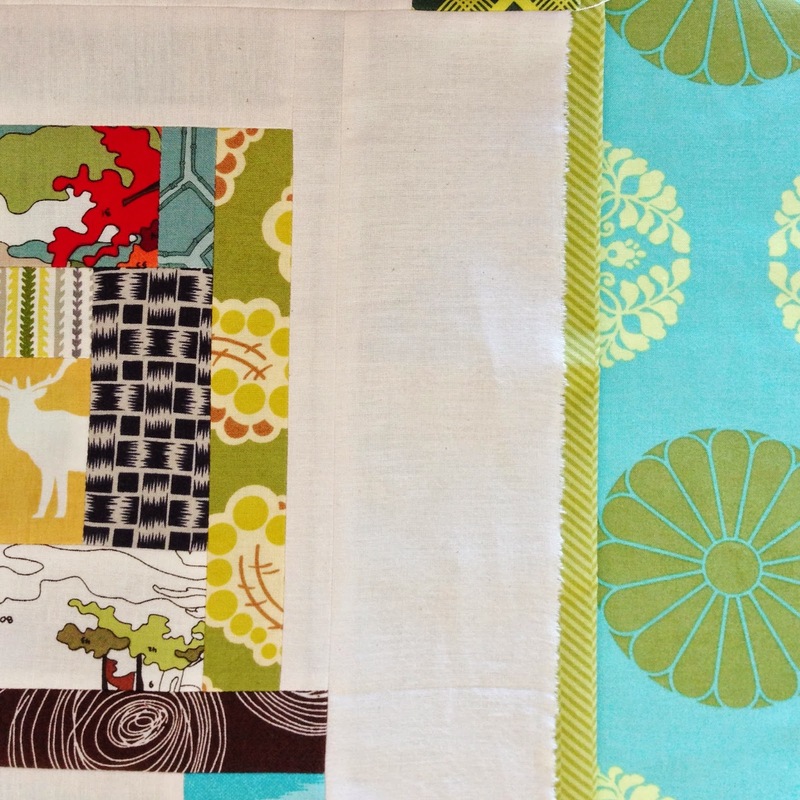 My favorite part of creating this quilt was playing with color, pattern and open space. Despite spending all day long sewing and making a big mess the day of the workshop, I came home with just a few random units of scraps sewn together. It wasn't until I got it home that it really started to come together. I spent about a week playing around with my pile of scraps. I was disappointed at first because it didn't look like Jacquie's beautiful quilt. Then I realized that of course it doesn't look the same. We are two different people. As soon as I was able to let that expectation go, a playful storm took over. I used Jacquie's techniques as a guide and trusted my own inner voice to create. Improv style quilting does not come naturally to me. I like to compose, arrange, and in other words, control the layout of my designs. It was exhilarating to shake up my creativity and try something different. If you ever get a chance to take one of Jacquie's workshops, do it! 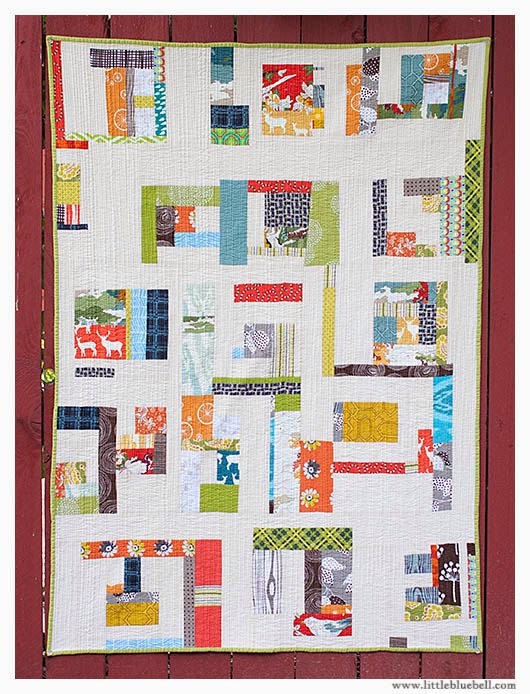 If you can't get to a workshop, she also covers this technique in the book she wrote with Katie Pedersen called Quilting Modern. The section of the book is perfectly named - Free Yourself. It took me awhile to get there, but I did eventually free myself. Maybe it doesn't come naturally to you, but the end result looks marvelous! Generally I am not a fan of improv (perhaps I like order in my life too much!) but this is wonky with a sense of control! I love you words-"a playful storm." That might be a good name for it! Okay, well, I like yours better! It's fabulous - great colours, great design. Great job! this is such a perfectly perfect quilt. I love everything about it, it's wonderful. I love it right down to the last bit!! I too have a hard time with improv.... 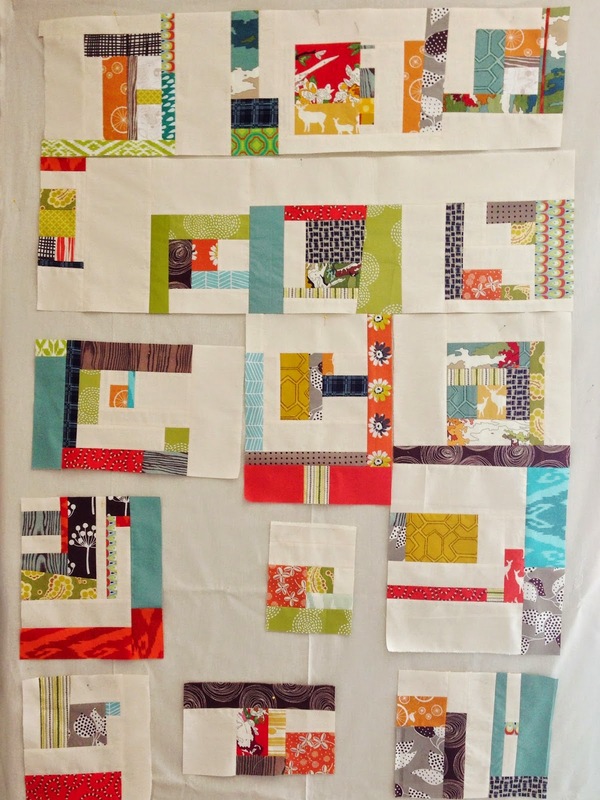 It's hard for me to let go of order... but I love how your quilt turned out... perhaps I should give it a go! Your quilt turned out beautifully! I'm impressed that you finished the matchstick quilting... I was going to do a quilt at 1/4" recently but after 1/2" I wussed out and bound it. 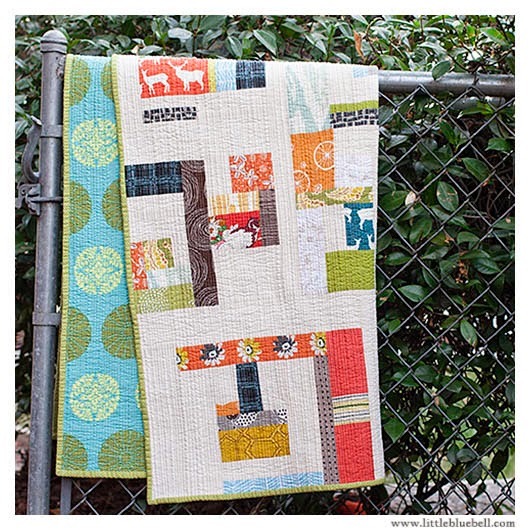 Great post, I would so love to take one if jacquie's classes, I have quilting modern which is my favourite book. I've taken one of her craftsy classes, which is probably as close as I'll get seeing as I live on the other side of the world. As far as I'm concerned I was born to improv. What a great experience. I am more of a just-let-it-happen type crafter in general but I have had trouble letting go in my short stint as a quilter. Improv quilts were the initial visual motivation for my love of modern quilting but I have only made one small attempt so far. Thanks for the inspiration to go big! Jacquie is such a great teacher! 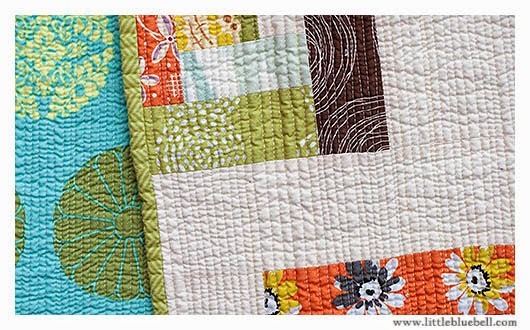 Your quilt looks awesome and I love the quilting! WAY TO GO! I love you Adrianne! So great to see this little bit of loveliness. Mine is still waded up in my bag LOL I can say I knew this quilt when. Hugs! I just love Jacquie! I hope I can take a class from her someday. I'm glad that you let go and played with your scraps. I have a really hard time doing improv. Let me rephrase that. I have never actually done improv but I would like to try. She would be the perfect coach. Your quilt is lovely and it looks like you had fun.